The crime situation in Sri Lanka would never have escalated to such a point without the direct support of the government, which is principally inclined towards the Sinhalese as they are a crucial vote-bank. It is also rumoured that the president’s brother Gotabaya Rajapaksa actively supports the BBS. Rajapaksa’s government turned a blind eye to the violence as a way to shore up its core constituency — the Sinhalese Buddhist population — which makes up about 75 percent of Sri Lanka’s 20 million people. But the Sirisena government could have easily put down the majority Singhalese community’s criminal networks that harm the nation by organized crimes. At the root of the failure of the government to check the violence is electoral politics. But unwillingness on the part of the regime to safeguard Muslims has made the life of Muslims terrible. Foreign embassies and the U.N. also demanded action. The United States canceled a five-year, multiple-entry visa held by the BBS’s general secretary, according to the group’s chief executive, Dilanta Vithanage. But he is a “big hero” in Sri Lanka. All attacks by the BBS have gone unpunished and hard-line monks, for the most part, have acted without fear of any legal repercussions. The Sirisena government is under fire, accused of failing to protect Sri Lanka’s tiny Muslim minority and allowing radical Buddhists spewing illegal hate speech to operate with impunity for years. Tensions between Buddhists and Muslims in Myanmar have been high since violence broke out in the state of Rakhine in June 2012, displacing over 1.3 million people. At the time, Human Rights Watch documented the role of the clergy that led mobs of attackers. 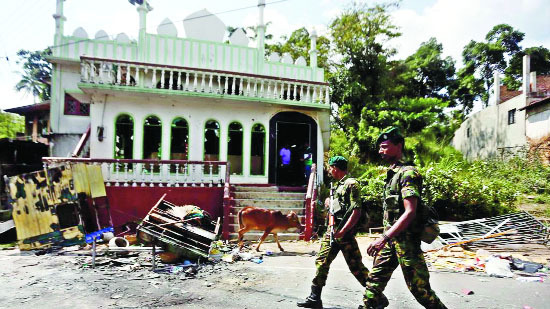 Deadly riots broke out between Buddhists and Muslims in southern Sri Lanka, killing and injuring the minority Muslims. Bodu Bala Sena (BBS, the Buddhist Strength Force), a nationalist Buddhist group with a notorious reputation, is being blamed for the incident. Galagodaatte Gnanasara Thera, the group’s leader, gave a speech around the time of the riots in which he claimed that the Sinhalese Buddhist population was under serious threat from the Muslims. This instigated further violence by large mobs, which attacked mosques and burned down shops and houses in Muslim neighborhoods. Muslim communities make up about 10 per cent of the total population in Myanmar and Sri Lanka, both of which have a Buddhist majority. The communal clashes in Myanmar have been attributed to the 969 movement, an Islamophobic movement led by Monk Wirathu. Touted as the “Burmese Bin Laden”, his hate-filled sermons have called for a boycott of Muslim businesses and have petitioned the government to introduce stricter inter-marriage laws. Writer: Prolific writer, Educationist, Independent Analyst, Investigative journalist, Columnist contributing articles to many newspapers and journals on world politics.